Online calculator. Angle between two planes. 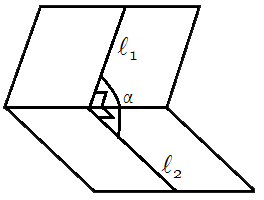 The angle between planes is equal to a angle between their normal vectors. The angle between planes is equal to a angle between lines l1 and l2, which lie on planes and which is perpendicular to lines of planes crossing. To find an Angle between planes 2x + 4y - 4z - 6 = 0 and 4x + 3y + 9 = 0.